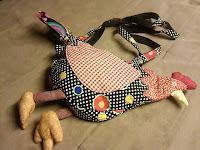 A few months ago when I spoke with Jen, an entrepreneur and Chicken Consultant in Chicago (yes, even the city of Chicago allows urban hens for eggs) about her business, she told me about a chicken purse that she carried which actually was what got her started....she had gone to visit her accountant, he asked about her chicken purse, and whaalaa, she helped him with getting his own hens going in his backyard. 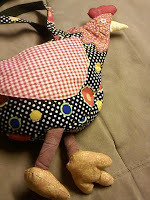 He joked that she should become a professional "consultant" to those who wanted to raise chickens, and she did! It was as a joke at first, but soon she realized that it was serious and people all over Chicago were interested. The "Chicken Purse" was one of the many things Jen and I had in common....I felt an instant camaraderie with her; we both had chicken purses! My own purse was made for me by my mother-in-law, Yone, who is a magnificent quilt and seamstress. It's one of a kind, quite adorable, and it's feet even sway to and fro as I carry it on my arm when I walk! If you see someone with it in town, it's me! Say hello!